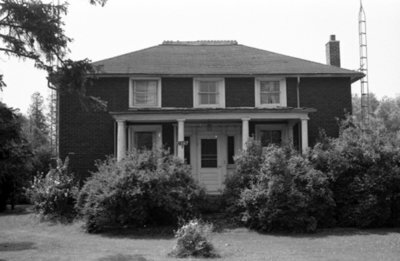 A black and white photograph of 1475 Dundas Street West. View is from the front of the house. This two storey frame farmhouse was built circa 1891 on the northeast side of Lot 34, Concession 1. According to the Cultural Heritage Evaluation Report and Documentation Report completed on 1475 Dundas Street West it is possible that the stone foundations of the house may date back to the 1830s. The house was demolished in 2013 for the link between the 401 and 407 highway expansion. 1475 Dundas Street West, July 1975, Brian Winter. Whitby Archives Archives A2013_004_035D.